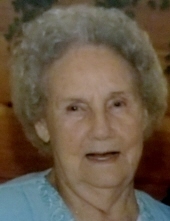 Lucy Francis McNurlin 99 of Westwood passed away Friday, February 08, 2019 at Woodland Oaks in Ashland. Lucy was born September 27, 1919 to the late Ben and Emma Jackson Dickison. She was a faithful member of the Westwood Wesleyan Church. Lucy was a private nurse and formerly worked at the Ashland T.B. Hospital. She also helped in the War effort by making shells at the Clanton Lambert Co., during World War 2. In addition to her parents she was preceded in death by her husband James William “Wid” McNurlin; one son Marvin McNurlin; five brothers Charles Dickison, Paul Dickison, John Dickison, Ben Dickison and Ray Dickison; Five sisters Eura Nicely, Hazel Thomas, Doris Garris, Lenore Dickison and Laura Dickison. She leaves behind her three loving sons John B. McNurlin (Ella), Paul D. McNurlin (Alice) and James W. McNurlin (Bobbie); four grandchildren Matthew McNurlin, Paul D. McNurlin Jr. (Jessica), Ann Whitacre (Justin) and Joanna McNurlin; six great-grandchildren Nichole Burke, Reed McNurlin, Gage Whitacre, Gracie Whitacre, Dylan McNurlin and Trenton Hager; along with a host of extended family and friends. Funeral services will be 1:00 PM Tuesday, February 12, 2019 at Caniff Funeral Home in Westwood with the Rev. Fred Andrews officiating. Burial will follow at Dixon Cemetery. Visitation will be Monday from 6-8 at the funeral home and one hour prior to service Tuesday. To send flowers or a remembrance gift to the family of Lucy Francis McNurlin, please visit our Tribute Store. "Email Address" would like to share the life celebration of Lucy Francis McNurlin. Click on the "link" to go to share a favorite memory or leave a condolence message for the family.